It's a great combination of elements working together towards one goal -- stop those dad pants. Father’s Day might be over, but the awfulness of dad pants lives on. 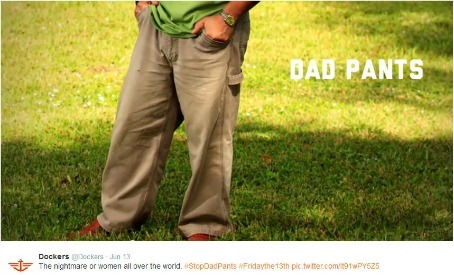 To help remedy that, Dockers has its #StopDadPants campaign. And even better, the brand has chosen a big-name football couple — San Francisco 49ers coach Jim Harbaugh and his wife Sarah — to serve as the face of this effort. This campaign is a great example of a marketing and PR effort that brings it all together — spokespeople, sports, hashtags, advertising, etc — to speak volumes about the brand and reach its audience. First, it’s hilarious. Sarah Harbaugh opens with a boom, calling dad pants a “shapeless, pleated tragedy.” It’s funny because it’s true. Going back to the choice of spokespeople — spot on. Sarah Harbaugh basically says her husband was once a cool jock and then he became a lame-a-zoid who wears horrible pants. It’s a sentiment that a lot of wives can relate to, particularly the slightly older crowd that would be most interested in a pair of Dockers pants. Years ago, the hubby was a stud. Now he’s rocking ill-fitting pants. And by featuring both Mr. and Mrs. Harbaugh, the campaign reaches both sides of the pants-buying equation. Wives and girlfriends will buy pants for shopping-averse significant others. But by involving a notable sports figure, it also reaches men directly. This ESPN hit is proof of that. Finally, a fun hashtag is a great way to get social media involved. There’s also a Twitter/Instagram photo contest that will win one lucky guy a chance to go to a 49ers game. And if that’s not viral enough, the brand sponsored a page on Buzzfeed. The campaign is promoting a flat-front style of pant that’s more modern and less like curtains, the Alpha Khaki. The Washington Post‘s style writer Robin Givhan blames Dockers for creating the dad pants problem they’re now trying to solve. Looking back, when Dockers were introduced in 1986, baby boomers were featured in the ads in all their dad pants glory. Now, with the more slim fitting trouser, there’s been a reversal. “It is ostentatiously not a Dad Pant. But it is not fashion,” writes Givhan. This is true, but it doesn’t even matter. There is a certain man that is only as stylish as a pair of Dockers. And if Dockers promises to bring that guy out of 1986 and into 2014, that’s really all the brand has to do.